At Windle Court this week, residents’ Gertrude and Jean joined our professional cooks, Poppy and Crystal, behind the scenes for a day in the kitchen. 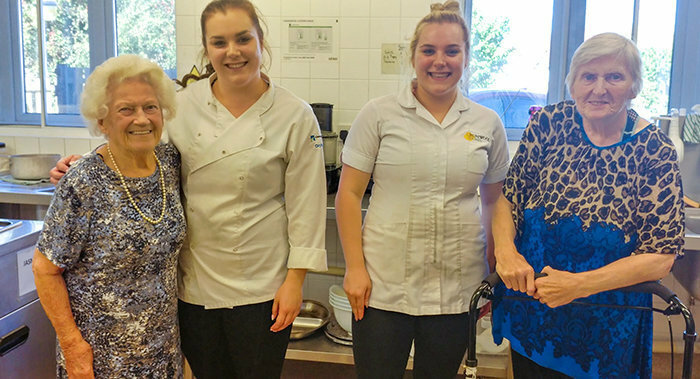 Becoming part of the Windle Court catering team, the residents enjoyed helping out and gaining an insight into a day’s work, including menu planning, food preparation and cooking a variety of meals throughout the day. Both Gertrude and Jean practised their culinary skills and saw food being freshly prepared and well presented for residents to enjoy together. The duo were very impressed as to how much work goes on each day to provide a varied menu for everyone living at Windle Court. Windle Court is a residential care home in South Woodham Ferrers, Essex, providing 24-hour care for older people, including those living with dementia. At Runwood Homes we believe in providing residents with a fulfilled life of dignity and independence, with choice and opportunity at the forefront of our care mission. For more information, please visit the Windle Court web page by clicking here.